Maria Giuseppa Campagiorni first appears in the Painesville, Ohio, area in 1908. In America, Maria Giuseppa Campagiorni was known by her married name, Mary Josephine Pachete. Maria Giuseppa Campagiorni, daughter of Sabastiano Campagiorni, was born on December 24, 1882, at Frosinone, Italy. She married Angelo Pacitto at Frosinone, Italy. Mary died on Monday April 22, 1946, at Lake County Memorial Hospital, Painesville, Lake County, Ohio, at age 63, of heart failure. 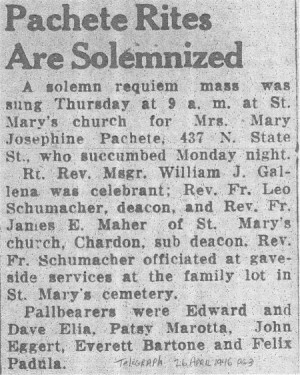 Her body was interred at Saint Mary Cemetery at Painesville Township, Lake County, Ohio. Maria Giuseppa Campagiorni immigrated to the United States on May 27, 1908, at age 25, travelling to Fairport Harbor, Lake County, Ohio. She was joining her husband, Angelo Pacitto, in Fairport. At the time of death, Maria resided at 437 North State Street, Painesville, Lake County, Ohio. 1. Salvatore Pacitto was born on August 15, 1903, at Frosinone, Italy. He married in 1946. Salvatore immigrated to the United States in 1954. Salvatore died on May 26, 1971, at Lake County Memorial Hospital, Willoughby, Lake County, Ohio, at age 67. His body was interred at Riverside Cemetery at Painesville, Lake County, Ohio, in 1971. His remains was moved in May, 2002, to an above-ground mausoleum at Westhampton Memorial Park Chapel, at Richmond, Virginia. 2. Sebastian J. Pachete was born on April 11, 1909, at Painesville, Lake County, Ohio. He married Viola Marotta, daughter of Guistino Marotta and Albina Ostoma. Sebastian died on December 15, 1982, at Holy Family Home, Parma, Cuyahoga County, Ohio, at age 73. His body was interred at Western Reserve Memorial Park at Chester Township, Geuaga County, Ohio. 3. Phillip Pachete was born on March 18, 1911, at Painesville, Lake County, Ohio. Phillip died on March 25, 1912, at Painesville, Lake County, Ohio, at 12 months, from spinal meningitis. His body was interred at Saint Mary Cemetery at Painesville Township, Lake County, Ohio. 4. Phillip Pachete was born on July 19, 1912. He married Rose Mary Elia, daughter of Antonio Elia and Filomena DeBiase. Philip died on July 8, 1992, at his home, Painesville, Lake County, Ohio, at age 79. His body was interred at St. Mary Cemetery at Painesville Township, Lake County, Ohio. 5. 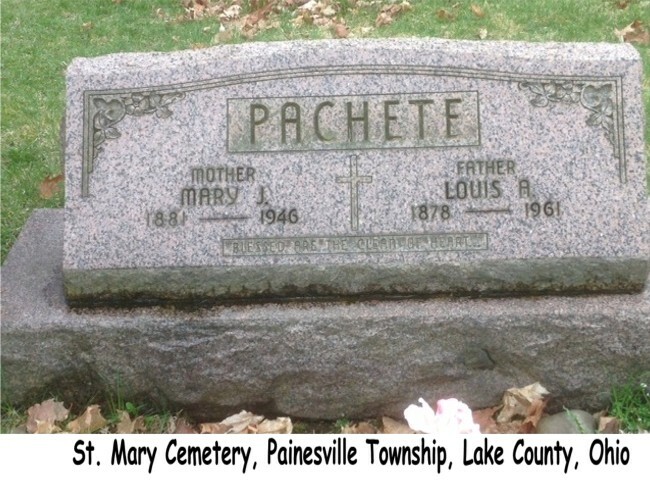 Louis Pachete was born on September 2, 1913, at Ohio. He married Elsie Mortland. Louis died on September 5, 1964, at Lake County Memorial Hospital, Painesville, Lake County, Ohio, at age 51. His body was interred at Riverside Cemetery at Painesville, Lake County, Ohio. 6. 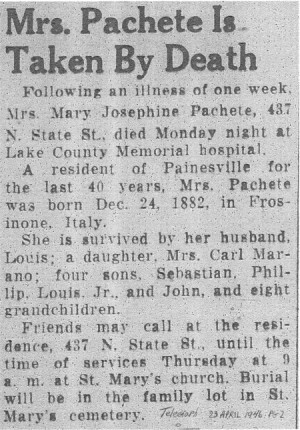 Josephine Pachete was born on October 16, 1917, at Painesville, Lake County, Ohio. She married Carl Tullio Marano, son of Felice Marano and Almerinda Venditti. Josephine died on January 12, 1991, at Phoenix, Maricopa County, Arizona, at age 73. Her body was interred at Phoenix, Maricopa County, Arizona. 7. John Paul Pachete was born on July 13, 1920, at Painesville, Lake County, Ohio. He married Evelyn M. Bittig. John died on December 24, 1968, at Lake County Memorial Hospital, Painesville, Lake County, Ohio, at age 48. His body was interred at Riverside Cemetery at Painesville, Lake County, Ohio.